Real Madrid has finally found the right path to scoring, as they've crushed Betis through a comfortable 5-0 scoreline. Cristiano Ronaldo didn't score tonight, but saw Bale and James Rodríguez scoring a brace each and Benzema netting his first goal of the season. It took two games for Real Madrid to earn their first win in La Liga this season, but they seem to have made an extra effort in not coming out short in terms of scoring goals. The Merengues have beaten Betis 5-0 this Saturday night at the Bernabéu and will now go into the upcoming international break with a bit less pressure on their back than they had coming into this game. Despite the goalscoring fest, Cristiano Ronaldo's drought has now extended to a 2-game streak and it had to be James Rodríguez and Gareth Bale stepping up to deliver Ancelotti's his first win as a Real Madrid coach. The Colombian and the Welshman scored two goals each, but still had Benzema joining them on the scoreboard thanks to a good finish from the French striker in the beinning of the second half. 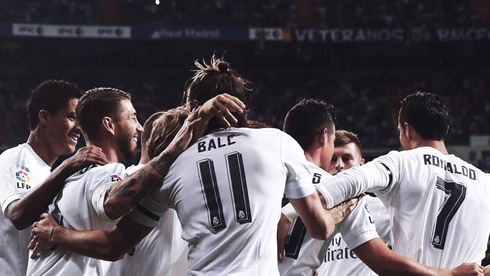 It was the first time the BBC lined up in an official fixture this season and as expected, Madrid looked a lot more threatening in the attack than last season against Sporting Gijón. The Frenchman wouldn't be the only change from that league fixture 6 days ago though, since Rafael Benítez also decided to bring on James Rodríguez into the starting eleven and benching Isco in the process. The Colombian would end up proving he was worth the call, as he finished the game with two great goals and one assist. The opener arrived quite early in the first half as it came down still before the 2nd minute had run off the game clock. The final pass was delivered by no other than James Rodríguez, who picked out Gareth Bale right in the heart of Betis' box, with his typical pinpoint precision. The former Tottenham star didn't waste such a good assist and easily headed the ball past the helpless Adán. As the half-time arrived, only Betis' manager felt like he needed to do any changes in his team. Benítez let things rolling the way they were and he got rewarded just a few minutes after the game resumed. In what was a great passing play from Madrid near the right sideline, it ended up being Bale putting in the decisive cross for an easy header finish from Karim Benzema. 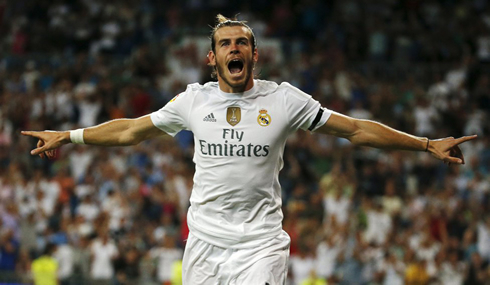 The Frenchman scored his first goal in the league this season and he had much to thank for to Gareth Bale. Just 3 minutes later, James Rodríguez would complete his brace and what a way he chose to display his technique and his special talent to score impressive goals. Toni Kroos had just gone for a low shot from outside the box, when James decided to try to control the ball with his right foot. Unexpectedly, the ball bounced a few meters above his head and the Colombian didn't hesitate in going for a bicycle kick. He may not had too much of an opposition near him and the distance to Betis goal was certainly short from where he was, but James executed the acrobatic move perfectly and put his team 4 goals up against a disorganized Betis side. The last goal of the game would be Gareth Bale's second on the night, with the Welshman going for power and accuracy when he was running with the ball close to his feet still well outside Betis' box. Already playing in his new role, the 26-year old seems to have finally convinced some of his critics with a good performance at the Bernabéu and this long range goal tonight will certainly help easening some of the pressure that has been piling up on him for the past few weeks and months. As for Ronaldo, he had some good chances to score, but his anxiety levels appear to be a bit higher than normal and it might be affecting him in the decisive moments in front of goal. 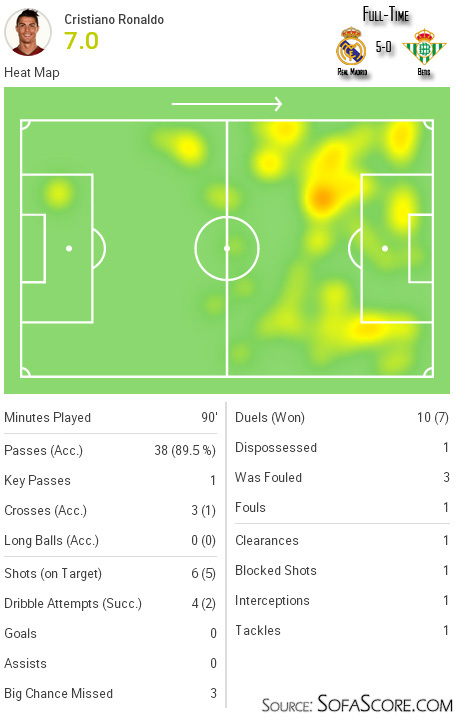 On SofaScore and as we can see in the graphism above, he finished the game with a 7.0 rating. Cristiano Ronaldo next game will be for Portugal, on the 7th of September of 2015, against Albania. You can watch Juventus live stream, Albania vs Portugal, Sevilla vs Atletico Madrid, Swansea vs Manchester United, Southampton vs Norwich, and Borussia Dortmund vs Hertha Berlin, all matches provided from our soccer live game pages.